SRF Living Prophets, Self-Realization & Kriya Yoga: What is a LIVING PROPHET ? What is a LIVING PROPHET ? Who is a Living Prophet? Who is MahAvatar Babaji ? Who is Lahiri Mahasaya ? First of all - a living prophet is usually NOT someone we see in this world of relativity who is occupying a physical form like yourself. Those persons whom you imagine to be "living " may like yourself, be spiritually dead. Those who are "true Living Prophets" are not concerned about having physical bodies or living in this material world forever. When the body's work is done they drop it, and after that we still see them working in and through the lives of serious devotees and truth seekers. The "Living Prophet" is often seen by His sincere, loyal, devotees. such experiences, ones mental state is far more clear than average and not usually subject to vain imaginings. The mind has long ago been mastered by the devotee. The Living Prophet is not necessarily someone, who in an institutions religious or political process is elected to some patriarchal high office, or sanctified as a saint. Now there are some cases where such persons that are elected can be very advanced spiritually, but not always necessarily. This at times only proves that he/she has loyally served the organization and has kept out of trouble. Certified does not always mean Qualified! Truly great leadership is a precious Gem. The living prophet may [or may not be] someone who founds a new church or spiritual path. In English we could say that such a person is a small "p" prophet. Such a one may or may not be spiritually reborn- spiritually alive/established in cosmic consciousness or Christ consciousness..
or opportunism, has attracted a lot of attention and is in a living bodily form. to the hooks, lines, and sinkers of a great orator/writer or people mover. on the popular beliefs of a particular culture or system. Beware; There are religious groups that are claiming that their church has the worlds only living prophets who speak not only for their church, but by some vain claim they say they have the authority to give some God's edicts to all mankind. This is a totally false claim! They are not living prophets by any means - they just like to give themselves vainglorious titles. Beware of those who make claims that are totally unsubstantiated. I assure you that those claims have already been proven to be false! the every day unreal world of relativity. Such persons are so very rare! This is part of the description of a genuine Living Prophet. from a matter bound slave into an unlimited and free soul. Seek that Reality which is God! "A bird in the hand is worth two in the bush[future.]" programming and mastered his consciousness and the natural world. This is one who has reached the pure state of Self-Realization. Such a person lives a pure life of disciplined inner bliss, and has a great deal of healing power and wisdom to share. Working in harmony with the divine plan for this world, such one appears free of the misdirections of ego, and is content with whatever he has. Such a one is a being of light. This great soul is also clearly described in the Bhagavad Gita. of the ego and arrogance attempting to become a celebrity. divine nature, and in all dealings in this world he is never desperate. know it is dead or alive! Check your history. Krishna etc., are still clearly working with their devotees in this world. Samadhi/Nirvana/Salvation, are as it is written - are spiritually dead. wealth, or celebrity status, without first achieving divine Self-Realization. If the Guru is in a body it is nice for a while! Will you see Him much? have the opportunity to spend much time with their Gurus. What if He dies tomorrow? Nothing is guaranteed in all this. teachings of the divine law and inspiration. Here one may want to ask - what about Guru Shishya/ Paramapara? through the successive Self-Realized presidents of the organization. when they maintain the sacred spiritual link directly with the Master's work[SRF org]. This story so impressed Br. David that he started using the mantra, “Guruji, I love you.” But he felt a little sad because he knew that Master, having left the body, could never respond to him in the same way he had with Brother Bhaktananda. 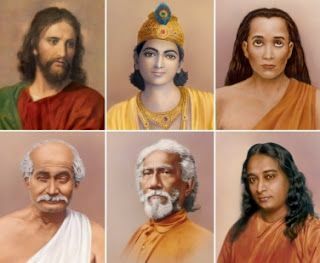 ******* USING THE GURUS PHOTOGRAPHS ******* by Br. Ramananda.. Brother R says that one of his favorite tools is using the guru’s photograph. On the eve of Master’s departure for the United States, Sri Yukteswar told him, “All those who come to you with faith, seeking God, will be helped. As you look at them, the spiritual current emanating from your eyes will enter into their brains and change their material habits, making them more God-conscious." There is a silent language that takes place between the guru’s eyes and yours. One time during a ceremony, Brother said he saw many devotees coming before Master’s picture, pronaming to him with such devotion that it seemed as if Master himself was the lighting on the picture. ** Brother saw two beams of light coming out like headlights from Master’s eyes and there were fast-flowing tears coming from them. He turned to some other devotees and asked him what they were seeing, and they said they saw the same thing, too. That’s why we use the photo of the guru. The guru is like a diving board, and when you are ready he pushes you off into the Ocean of Spirit. - Om Gurudeva !!! Shared from the facebook site >>> Friends of SRF in DC Metro Area O O O O O M M M M M M M M MM MM MM MM MM MM……. Faith is not blind belief, Blind belief is not Faith. Blind belief is simply blind belief ! and disease, of ignorance and lack, of fear and doubt. I will add to this again, that blind belief is the absence of evidence and results by incorrect ideas. Blind belief is an idea that is emotionally, not rationally held on to. Faith is an idea that stands the proper tests of reason and research.This is where intellectuals often get confused, Faith is the real thing, Belief can be true or false. Even reason, without proper data, in a mind that has been programmed by society to see only the most limited aspects of a matter, is still caught up in blind belief. This is called "building a house on sand" - it won't stand up for long. their beings purified from poisonous delusion by the antidote of Wisdom. - such men reach the state of non-return." a cow an elephant, a dog, an outcast." The relativities of existence (birth, death, pleasure and pain) have been overcome. enthroned in spirit - verily, the taintless, the perfectly balanced spirit." “ John 14:1 Let not your heart be troubled: ye believe in God, believe also in me. 2. In my Father’s house are many mansions: if it were not so, I would have told you. I go to prepare a place for you. 11. Of judgment, because the prince of this world is judged. 13 .Howbeit when he, the Spirit of truth, is come, he will guide you into all truth: for he shall not speak of himself; but whatsoever he shall hear, that shall he speak: and he will shew you things to come. "God has sent you to me, and I shall never fail you... "Even when I am gone my help will always be given to devotees all over the world, if they keep in tune. Never think for a moment that when I am physically absent from you all, I am not otherwise with you. I shall be just as deeply concerned for your spiritual welfare when I am no longer in the body as I am now. I shall always be watching over each one of you, and whenever a true devotee thinks of me in the silent depths of his soul, he will know that I am near." 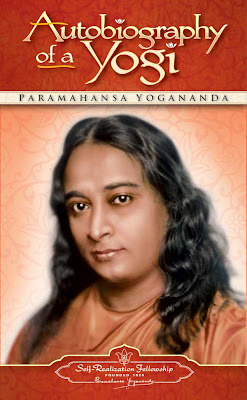 Paramahansa Yogananda, quoted in the SRF calendar, August, 1993.
and you will attain everlastingness in heaven." Page 38-39 , Vedanta Press, Crest-Jewell of discrimination, 1947 translation by Swami Prabavananda and Christopher Isherwood. Mentor Books. "My instant petition to the divine mother was instantly acknowledged. First , a delightful cold wave descended over my back and under my feet, banishing all discomfort. Then to my amazement the temple became greatly magnified. Its large doors slowly opened, revealing the stone figure of the Goddess Kali. Gradually the statue changed into a living form , smilingly nodding in greeting, thrilling me with joy indescribable As if by a mystic syringe, the breath was withdrawn from my lungs; my body became still though not inert. An ecstatic enlargement of consciousness followed. I could see clearly several miles over the Ganges River to my left. and beyond the temple to the Dakshineswar precincts. The walls of all buildings glimmered transparently; through them I observed people walking to and fro over the distant acres. In either state I saw the distinctly the whole Dakshineswar panorama..............................."
marriage, and resulted in a major transformation in the life of his brother in law." of human sensory limits. 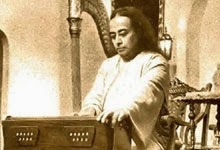 This ability of the Living Prophet continues after the death of the body - thousands of witnesses have testified that after Paramahansa Yogananda's body death they have received a great deal of amazing help and healing from Him personally and indirectly. Note; all other non - SRF 1946 editions are incomplete and out of date, including Kindle. Read this complete edition for the real Yogananda! The founder of SRF ordered this work so that we can all learn and grow to our greatest potential. It is this classic that destroys all those false"only One Way" claims. only once, you are not ready for the depth and value of this life enhancing message. which meet the different needs of all seekers. If this Holy SRF path is really for you - you will know it! But what is in this classic is worth the effort of careful study and practice! beginning of your accelerated journey of Self-transformation to a better life. this site and all material herein is copyrighted by F. Parente and those quotes credited. Picture Window theme. Theme images by konradlew. Powered by Blogger.